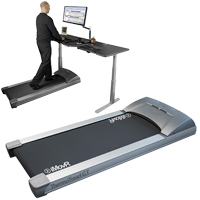 The new ThermoTread GT Desk Treadmill from iMovR is the first treadmill ever to be designed specifically for "Working While Walking". With the move towards active working the ThermoTread is the ideal treadmill solution for pairing with a sit-stand desk to create a true Walking Workstation. Rather than attempting to adapt a traditional running treadmill to an office environment iMovR went directly to the drawing board and designed the ThermoTread GT from the ground up. The result is a treadmill built to suit the needs of the office environment--smaller footprint, lower profile, reduced noise levels, lower energy consumption, and most important of all-- safer. At just 67.5" long the ThermoTread GT can be accommodated in the smallest of workstations while still providing a large 20" by 50" walking surface. 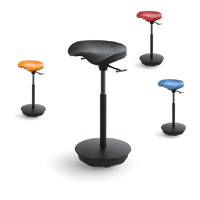 The low deck height of 5" enables it to be successfully partnered with a wide range of sit-stand desks. Safety is important with the ThermoTread which is why it has a maximum speed of just 4 kph, a brisk walking pace for most adults. This feature greatly reduces the potential for injuries which can occur with repurposed or adapted treadmills. The ThermoTread GT is able to offer lower energy consumption and extended life expectancy as the motor and gearing are designed for optimum power at walking speeds. Adapted treadmills are designed for optimum power at higher speeds and can be overloaded by continuous use at walking speeds, significantly reducing their lifespan. The ThermoDesk GT is rated for up to 400 lbs, making it a good choice even for heavier users who wish to move to a more active workstation. The 1" thick Bakelite deck on the ThermoDesk GT provides a firm surface ideal for walking. The deck is supported by six compression shocks which allow the surface to absorb impact and reduce impact stress on the joints. The convenient touch-control interface of the ThermoDesk GT is placed on the desk surface for easy access and provides users with a full compliment of options for customizing the treadmill to their specific weight, stride length, speed, and desired working pattern. The multiscreen interface enables users to quickly navigate through all settings and adjust them as desired. Up to five user profiles can be stored for fingertip recall. Future software upgrades can easily be downloaded through the integrated USB port. The upcoming iMovR CloudStation will connect the ThermoTread GT to the "Internet of Things", enabling detailed control of every aspect of the workstation environment by monitoring and controlling office device energy consumption, monitoring and recording treadmill usage, and providing maintenance data from anywhere in the world. It will also enable CloudStation users to access their personal profiles at any CloudStation-equipped ThermoTread GT in the world, offering a boundary-free health monitoring network. 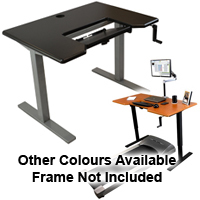 The manufacturer recommends that the Thermotread GT Desk Treadmill be placed on a firm non-carpeted flooring surface. Users may wish to purchase the RightSize Premium Under-Treadmill Mat to protect hardsurfaced flooring from potential damage. Placement on carpeted surfaces may result in a "floating" effect and encourages collection of dust and lint within the treadmill. As well, in order to ensure premium performance and to optimize the life of the treadmill, regular lubrication of the treadmill deck is required using a 100% silicone spray such as the EasySpray Treadmill Lubricant. Armaid is a therapeutic self-administered massage device for relaxing, releasing and stretching the tissues of the forearm and hand. Armaid can help to relieve the pain and discomfort of computer-related Repetitive Strain Injuries, muscle tension, carpal tunnel syndrome, golfer's elbow, tennis elbow, tendonitis, de Quervain's tenosynovitis, and lymphedema. 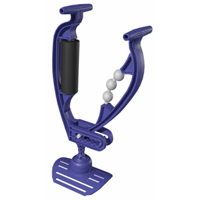 Armaid uses a patented lever design to mimic the techniques of professional mobility massage, and puts the user in control of the pressure and direction of the massage stroke. The device can be customized with four, interchangeable rollers of varying densities, allowing the user to deliver just the right amount of pressure— from focused, intense release of muscles and fascia, to gentle enhancement of circulation. Armaid is sturdy, durable and lightweight. 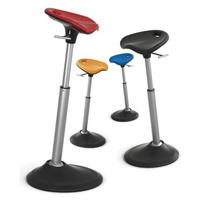 It is designed to be used in a seated position, with the device resting freely on the thigh, or strapped to the thigh for additional stability. Note: Leg Strap accessory is included with the Armaid Package and the Armaid Complete only. Otherwise sold separately. This new universal FLEXTEND® glove addresses the same conditions as the non-reversible model, including Carpal Tunnel Syndrome, Trigger Finger, Tennis Elbow and Grip-Strength, but does so by fitting both hands. Now, you only need one glove, instead of one for each hand. 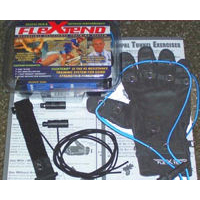 This product comes with a fold-out Instructional Chart that includes programs for Carpal Tunnel Syndrome, Trigger Finger, Tennis Elbow, and Grip Strength. 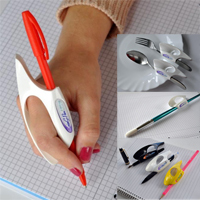 Note: This product is covered by our 30 Day Customer Satisfaction Guarantee. The Omega Everest Table Top, part of iMovr's ThermoDesk line, features an innovative keyboard tray built directly into the surface of the table top. The new "SteadyType" keyboard tray helps reduce wrist extension and monitor shake at standing and walking workstations, and helps users of treadmill desks counter the 'backwards-pulling' effect of the treadmill. Users moving to standing workstations and walking workstations can sometimes find it difficult to position the keyboard at a steep enough negative incline. The result is wrist extension, i.e. an upward bend at the wrist that can increase the risk of injury to the hands, wrists and forearms. The integrated, inset design of the "SteadyType" keyboard tray allows users to position the keyboard at steep negative inclines, from 0° to -85°. Another issue for walking workstation users is the tendency to anchor the heels of the hands to the desk in an effort to keep their hands correctly positioned over the keyboard. This results in a constant, and significant strain on the muscles of the arms, shoulders and upper body. The greater degree of negative tilt offered by the "SteadyType" keyboard tray helps users more easily counter the backwards pulling effect of the treadmill. With the keyboard tray inclined at a steeper negative incline the backwards pull of the treadmill now works in the user's favour to hold the user's hands in position against the keyboard. Both of the above issues are addressed by the SteadyType Keyboard Tray. The improved hand and wrist positioning enables users to maintain good walking posture while letting the muscles of the hands, forearms and upper body relax. This more natural posture will result in improved typing performance over standard 'flat-topped' walking workstations. 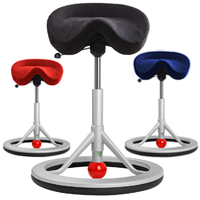 By integrating the "SteadyType" keyboard tray into the body of the table top and moving it closer to the centre of the desk top, iMovr has succeeded in significantly reducing the phenomenon known to users of height adjustable workstations as 'monitor shake'. On the Omega Everest table top, the mouse sits on the primary desk surface but remains easily accessible within the Comfort Zone due to the unique positioning of the keyboard 'in' the desktop. The "SteadyType" keyboard tray has two height settings that enable the user to select the most beneficial positions for the keyboard and mouse relative to each other. The 1 1/8" thick Omega Everest ThermoDesk Table Tops feature softly rounded edges and corners, vacuum-wrapped at high heat. The 3D Lamination process creates a seamless surface and the grommet hole interiors are perfectly covered and sealed. The worksurface has no sharp edges or square corners and is completely non-porous, helping to protect it from humidity and spilled liquids. Multiple layers of finish provide resistance to abrasion and damage from many common cleaning and disinfectant products. A wide palette of colours, including Hayward Cherry, Clove Mahogany, Light Maple, Urban Walnut and others ensure the right tone in any office environment from entry level to senior executive. The Omega Everest tops are pre-drilled to fit the iMovR Elite electric height-adjustable desk frame and are fitted with threaded metal inserts to ensure quick and measure-free installation with a single Phillips screwdriver. The metal inserts ensure a well-secured top as well as the ability to remove and replace tops without wear on the mounting points. Note: Omega Everest tops may be installed on other sit-stand desk frames; however, the threaded inserts might not be useable. It will also be necessary to ensure that these frames do not interfere with the incline and height adjustment of the integrated SteadyType keyboard tray. The Omega Denali ThermoDesk Table Top from iMovR introduces a new concept in keyboard tray design. Inset directly into the surface of the table top, the "SteadyType" keyboard tray helps users at standing and walking workstations reduce wrist extension and "monitor shake." 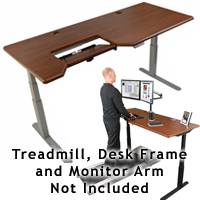 It can also help users at treadmill desks counter the backwards-pulling effect of the treadmill. Users moving to standing workstations and treadmill desks can sometimes find it difficult to position the keyboard at a steep enough negative incline. The result is the upward bend at the wrist, known as wrist extension, that can increase the risk of injury to the hands, wrists and forearms. 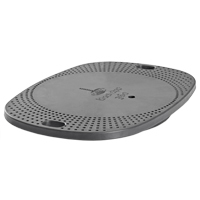 The "SteadyType" design allows users to adjust the angle of the tray from 0° to -85°. The "SteadyType" keyboard tray is an even greater step forward in keyboard positioning for treadmill users. To counter the tendency to drift backwards on the treadmill as they type, users often anchor the heels of their hands to the desk, exerting significant downward force from the upper body in an effort to keep their hands in position over the keyboard. With a greater degree of negative tilt on the keyboard, users can avoid this backwards drift by bracing themselves passively against the keyboard. With the keyboard tray inclined at a steeper negative incline the backwards pull of the treadmill now works in the user's favour to hold the user's hands in position against the keyboard. This improved hand and wrist positioning enables users to maintain a better walking posture while letting the muscles of the hands, forearms and upper body relax. This more natural posture will result in improved typing performance over standard flat-topped walking workstations. By integrating the "SteadyType" keyboard tray into the body of the table top and moving it closer to the centre of the desk's crossbar, iMovr has succeeded in significantly reducing the phenomenon known to users of height adjustable workstations as "monitor shake." On the Omega Denali table top, the mouse sits flat on the primary desk surface but remains easily accessible within the Comfort Zone due to the unique positioning of the keyboard 'in' the desktop. The "SteadyType" keyboard tray has two height settings that enable the user to select the most beneficial positions for the keyboard and mouse relative to each other. The Omege Denali ThermoDesk Table Tops feature softly rounded edges and corners. Using 3D Lamination Technology, the 1 1/8" thick high-density MDF tops are vacuum-wrapped at high heat. This creates a complete and seamless film across the top and edges of the table top, and even includes the grommet hole interiors. The worksurface is completely non-porous, ensuring protection from humidity and liquids. Multiple layers of finish provide resistance to abrasion and damage from many common cleaning and disinfectant products. A wide palette of colours, including Hayward Cherry, Clove Mahogany, Light Maple and Urban Walnut ensure the right tone in any office environment from entry level to senior executive. The Omega Denali tops are pre-drilled to fit the iMovR RELEVATE manual adjust frame and fitted with threaded metal inserts that ensure quick and measure-free installation with a single Phillips screwdriver. The metal inserts ensure a well-secured top as well as the ability to remove and replace tops without wear on the mounting points. Note:The Omega Denali tops may be installed on other sit-stand desk frames but the threaded inserts might not be usable in those applications. It will also be necessary to ensure that these frames do not interfere with the incline and height adjustment of the integrated SteadyType keyboard tray.